Killing a wild bird involves nearly flawless insertion into both the time and space continuum, you know, being in the right place at the right time. 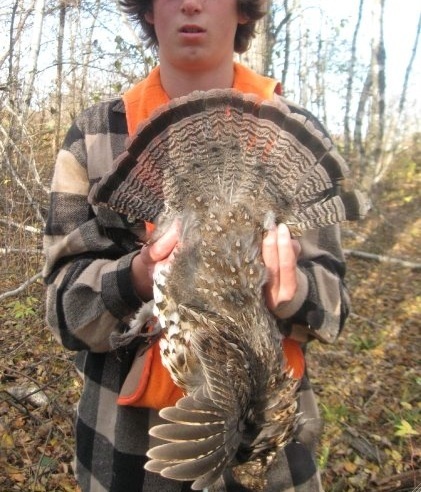 Trouble was, I’d put the kid into those sweet spots a goodly number of times in the last two seasons in an attempt to get him his first ruffed grouse before the Sirens of high school – girls, cars and sports – chilled his wing-shooting ambition. He missed, of course, or farted around with the safety or was too slow to mount the gun every time we hit that time/space crossroads and The King eluded the kid in a thunder of wings and flash of gray. But the black Lab and me or my hunting partner and his French Brit continued to stack the odds in the kid’s favor. Eventually it paid off. A grouse ran out from under the Britt’s nose and as the dog relocated in the tangle of alders, the kid moved off to my left, toward the cornfield abutting the thicket. The bird exploded from somewhere behind me, banking for the sky, giving the kid what amounts to a decent shot in the New England grouse woods. He pulled the trigger, the bird tumbled and mission was accomplished. I snapped pictures, him proud and happy, the bird limp and warm. More than anything, I wanted somebody to hit the pause button on that constantly moving time and space continuum. I wanted to stay right where we were, to stop time from shifting the moment to memory. I like your little corner of the blogosphere, guys. I’ll make sure you’re added to my own blogroll.